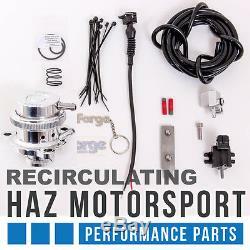 Ford Fiesta Mk7 ST ST180 Forge Motorsport Recirculating Dump Valve Kit 1 x FMDVST180R. Product Description The Recirculating valve is for the turbocharged 1.6-litre EcoBoost petrol engine found in the Fiesta ST. It is recommended for any vehicle where the boost pressure has or is going to be increased by an ECU software upgrade, Our alternative is a fully engineered solution, offering significantly improved reliability. 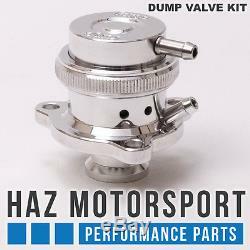 Our valve and installation kit replaces the original unit with a pressure/vacuum operated piston valve, that still also retains the desirable OEM ECU control over valve actuation. This product has been thoroughly designed and tested with the expressed intent of offering improved valve response and maintaining ECU control while resulting in absolutely NO fault codes, NO check engine lights, and no adverse effects of any kind. All of the necessary components and detailed instructions are included and everything is designed to make installation as simple as possible. 1 x FMBGFK4 Boost Tap and Bolt. 1 x Solenoid, Bracket and Screws. 1 x Blue Spring (Uprated). 1 x 2000mm Length of 4mm Vacuum Hose. 1 x Forge Key Ring and Sticker. The item "Ford Fiesta Mk7 1.6 ST ST180 Forge Motorsport Recirculating Dump Valve Kit" is in sale since Tuesday, January 27, 2015. This item is in the category "Vehicle Parts & Accessories\Car Tuning & Styling\Air Intake & Induction\Dump, Bypass & Blow-Off Valves". The seller is "haz_motorsport" and is located in GB. This item can be shipped worldwide.